So my personal unease with 9/11 memorials is the feeling that there are a lot of people in this country with a vested interest in the country not moving on, even though the two main perpetrators of the attack are either dead or in US custody and the organization they led has been soundly defeated. They want our leaders to keep delivering the Gettysburg Address every year, to keep us on that war footing, so that they can misdirect our resources and some Americans’ lives in the service of foreign and domestic policy goals that have nothing to do with what happened on 9/11. This manipulation of memorialization by keeping the wounds open was quickly apparent to some, of course. For all the good that did. 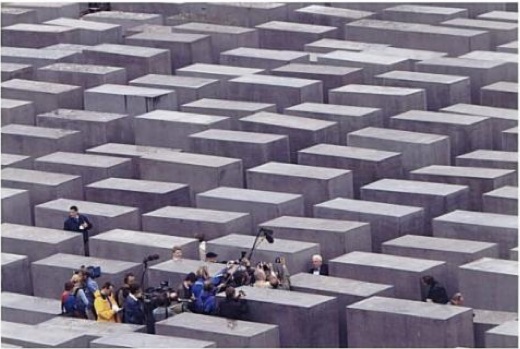 I recently came across this photo of Louis Kahn’s “Monument To The Six Million Jewish Martyrs,” which, I had no idea. And it was to be built in New York City, Battery Park, to be exact, and was perhaps the last best chance for an apparently serially disastrous effort to build a Holocaust memorial in the city. Ultimately, of course, the city did get the Jewish Memorial Museum in the 1990s, in Battery Park. There is no doubt a story to tell about the tumultuous history of that process. And I’m sure someone has already written a decisive history of how people attempted to grapple with the Shoah and Holocaust as history, and how and when those concepts took hold. Because they’re absent from the contemporary discussion of this memorial. But what really sticks with me is the story and particulars of Kahn’s memorial design, and how resonant it seems with memorials followed it. In an age that has made a flat mockery of conventional memorial values and platitudes, Mr. Kahn’s solution is a cool, abstract, poetic, powerful and absolute statement of the unspeakable tragedy. 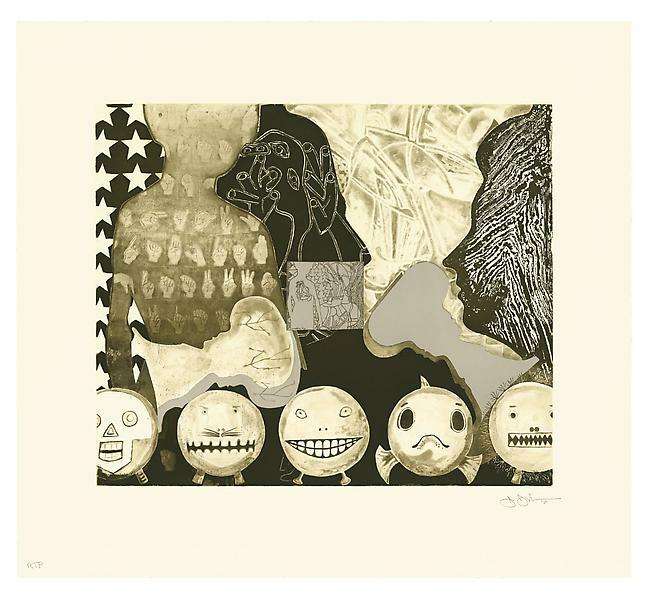 It could rank with the great works of commemorative art in which man has attempted to capture spirit, in symbol. for the ages. The generation that lived through the time and events the monument proposes to commemorate will never forget them. We have that memorial seared in our souls. The generations that are innocent of this kind of totalitarianism and ultimate tragedy will find no monument meaningful. That is one of the anachronisms of art and history in an age of violence. This memorial could work, as art and as history, and as a lasting expression of the human spirit. In a nihilistic, value-destroying society, that is no mean artistic accomplishment. Yow, no Summer of Love here. I think Kahn’s 1967 proposal is at least one of the earliest, if not the first, deployments of Minimalism in a memorial context. Or maybe Post-Minimalism is more accurate, since Kahn’s evocative forms and their deliberate emotional and experiential evocations were anathema to the objective Gestaltism of orthodox Minimalism as it was being argued out at the time. If the history of using a Minimalist formal vocabulary for intractable memorials typically began with Maya Lin’s Vietnam Memorial, then Kahn’s Monument pushes it back 15 years–to the conflict-torn heart of the Vietnam era. 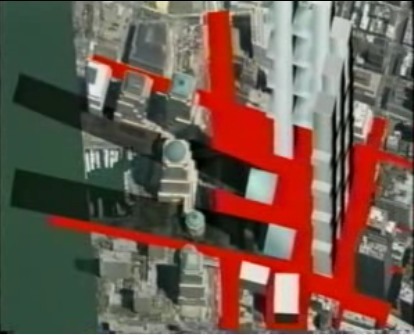 And though it wasn’t realized as he envisioned, Kahn’s proposal was influential. It’s the best explanation I can see for for the use of glass block in New York State’s disappointing Vietnam Veterans Memorial on Water Street in lower Manhattan. 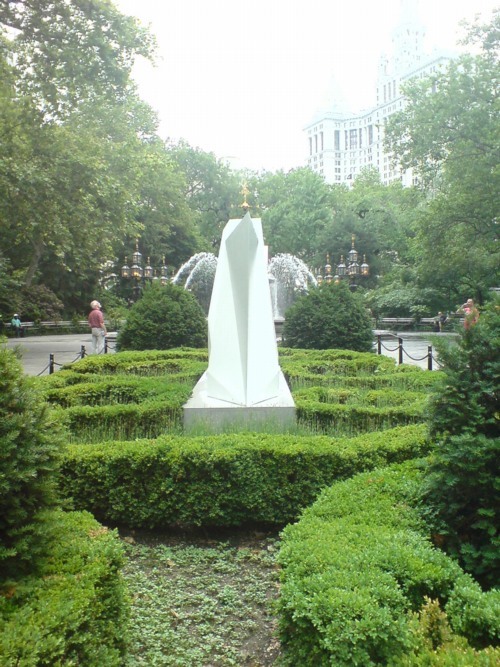 [That memorial’s plaza siting was probably also influenced by Huxtable’s unequivocal condemnation of the Battery Park site for Kahn’s memorial, an insurmountable criticism which probably doomed the design she praised so highly.] More directly, though, Kahn seems like a direct progenitor for the two most prominent Holocaust memorials built in Europe to date. 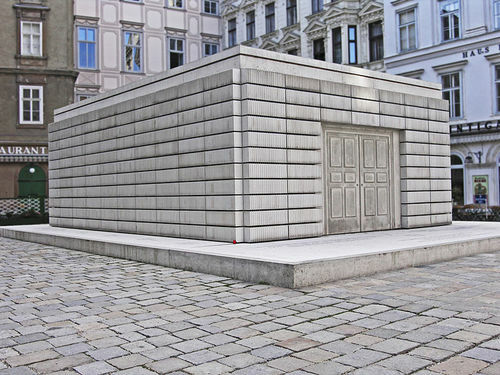 Kahn’s formal references to the silenced, the room-scale, and the bookshelf-like bands of glass brick are all echoed in Rachel Whiteread’s Judenplatz Holocaust Memorial, where a ghostly library of books the city’s murdered Jews will never write stands on a plinth in a public square in Vienna. Whiteread’s memorial has obvious precedents in her own sculptural practice, and I’ve never seen her mention Kahn as an inspiration, so it’s entirely possible that these resonances are natural and widely held, and which the artist and architect arrived at separately. I can’t believe that’s what went down, however, with Peter Eisenman and Richard Serra. From its central formal device–passages between impenetrable, figure-dwarfing blocks–to its title, Memorial to the Six MIllion Murdered Jews of Europe, Eisenman and Serra [who subsquently removed his name from the project] had to have been very familiar with Kahn’s proposal, and with the politically fraught development process that spawned it. 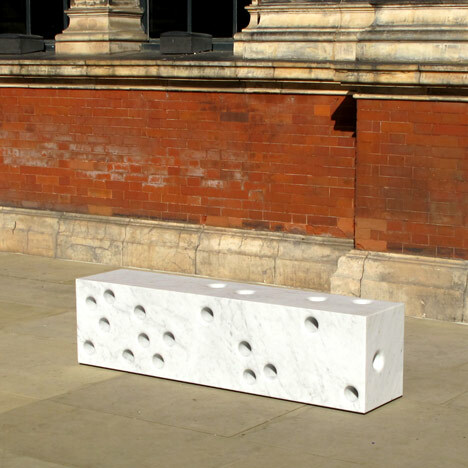 Speaking of violence and sculptural street furniture, the design team of Edward Barber and Jay Osgerby and Tor Studios made one of a series of commissioned benches for the Victoria & Albert Museum during the London Design Festival. It is an elegantly pockmarked block of Carrara marble. They were inspired by shrapnel marks left in the V&A museum’s western facade after the Second World War. “It’s something that always fascinated me and Ed on the way from South Kensington tube up to the Royal College when we were students, and so when this project came up we thought it was a nice way to reference that,” explained Jay Osgerby at the opening. 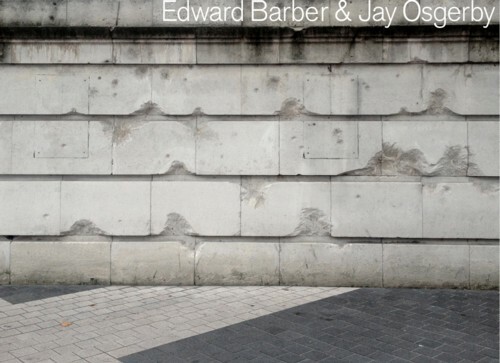 Indeed, the splash page for the duo’s website is currently an image of the shrapnel marks. Which, of course, immediately brings to mind the facade of JP Morgan’s former headquarters, 23 Wall Street. The building was damaged by an explosion on Sept. 16, 1920, that was believed to be carried out by Italian anarchists. A donkey cart laden with 100 lbs of dynamite and 500 pounds of cast-iron window sash counterweights exploded at 12:01, killing 38 and injuring more than 143 people on the street and in the building. 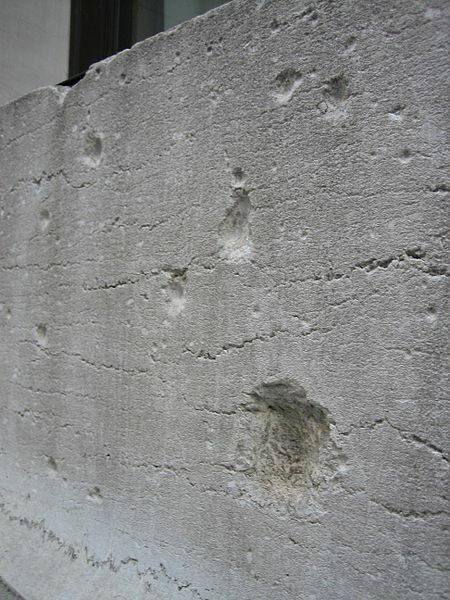 Morgan refused to repair the shrapnel marks, which are still visible on the pink marble Wall St. facade to this day. The building, long vacant, is currently being marketed as a retail site, perhaps for a department or Apple store. 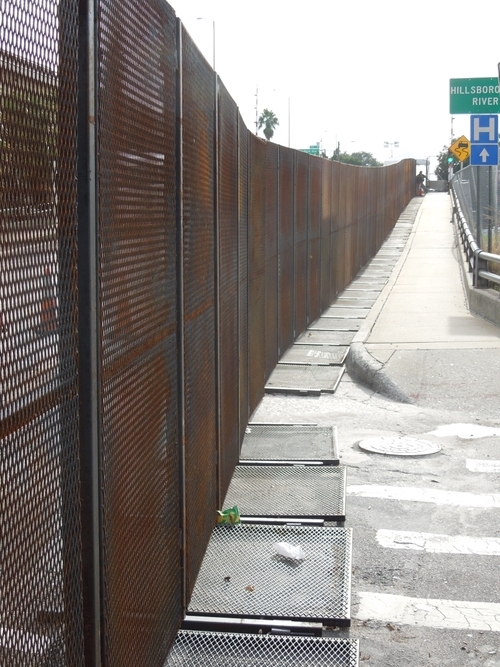 I’m really trying to get this writing thing done tonight, but I just have to point out that Richard Smith’s photo of the Secret Service’s six-mile perimeter fence at the RNC in Tampa is awesome. It’s like if Christo and Serra were cellmates and Cady Noland was their baton-wielding guard. 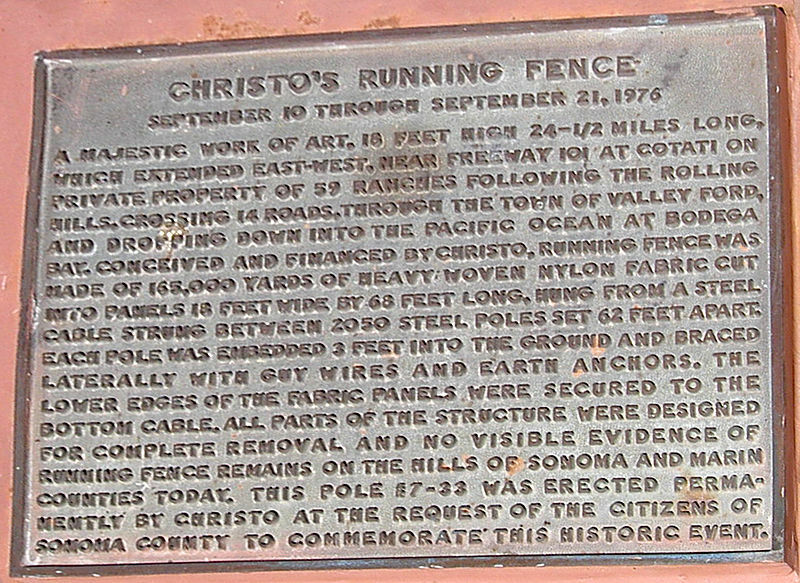 Speaking of Running Fence, there are two historical markers in Marin County commemorating Christo & Jeanne-Claude’s 1976 project. 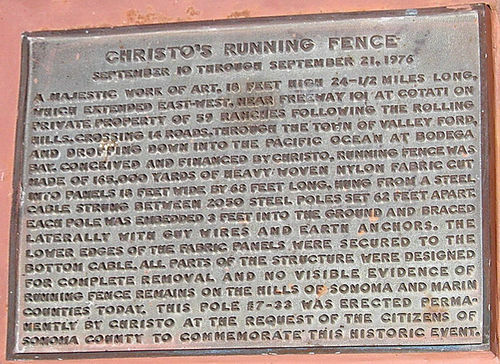 see full size images at the Wikipedia entry for Running Fence. Please. 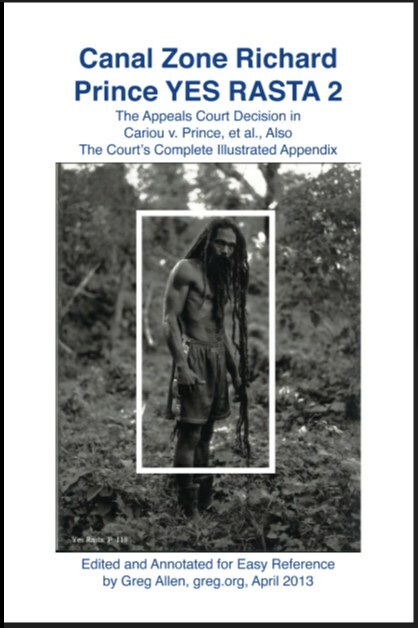 3 sessions at Superior Court, an environmental impact report and the temporary use of the hills, sky, and ocean. Watson School Park is currently listed as closed for renovation. It is not known whether the marker is affected. A majestic work of art, 18 feet high 24-1/2 miles long, which extended east-west, near Freeway 101 at Cotati on private property of 59 ranches following the rolling hills, crossing 14 roads, through the town of Valley Ford, and dropping down into the Pacific Ocean at Bodega Bay. Conceived and financed by Christo, Running Fence was made of 165,000 yards of heavy woven nylon fabric cut into panels 18 feet wide by 68 feet long, hung from a steel cable strung between 2050 steel poles set 62 feet apart. Each pole was embedded 3 feet into the ground and braced laterally with guy wires and earth anchors. The lower edges of the fabric panels were secured to the bottom cable. All parts of the structure were designed for complete removal and novisible evidence of Running Fence remains on the hills of Sonoma and Marin Counties today. This pole #7-33 was erected permanently by Christo at the request of the citizens of Sonoma County to commemorate this historic event. I believe this is it, next to the post office. Looks like it’s presently being used as a flagpole. 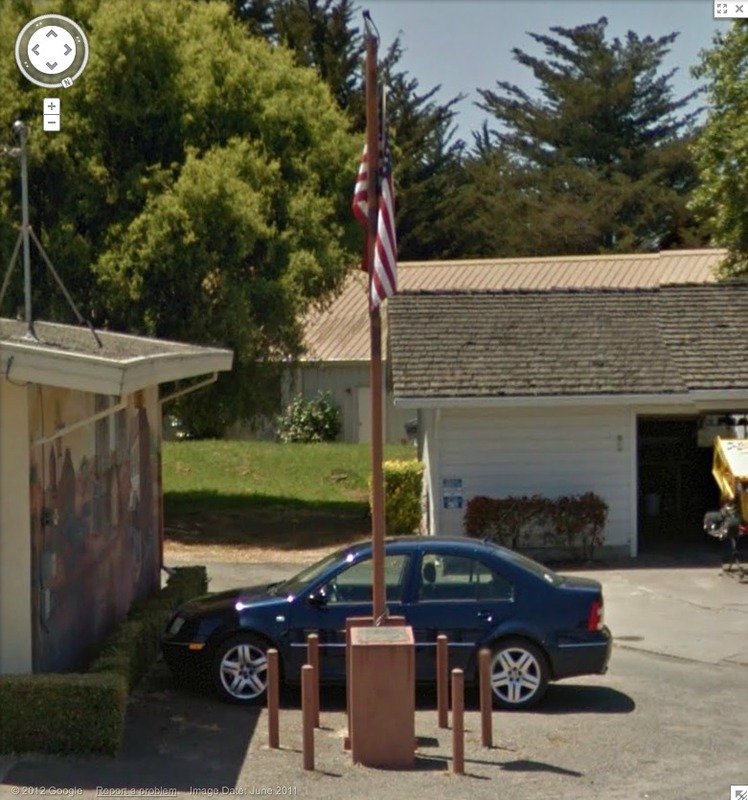 Oh, the Bodega bay Heritage Gallery has a photo of the fancier plaque on the other side of the pole. 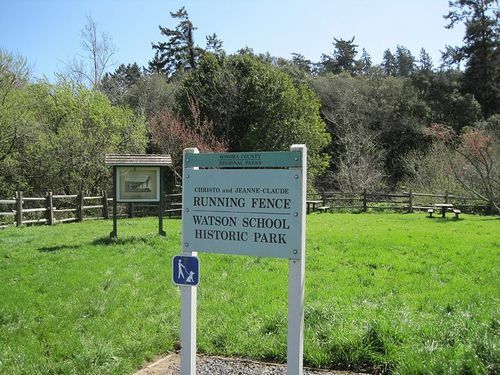 Also, Running Fence was acquired by the Smithsonian American Art Museum. 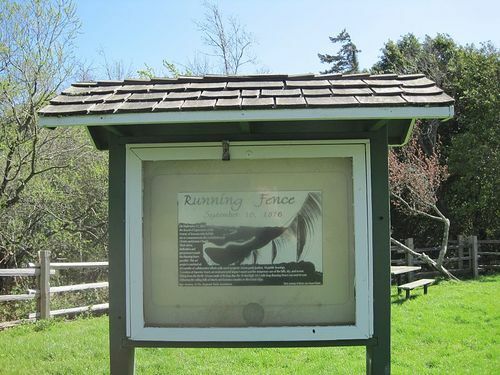 Remembering Running Fence was on view in 2010. If moving it away from that mural didn’t destroy its context, I would definitely replicate that, as is, stanchions, flag and all. Maybe a vinyl wallpaper photomural would work. Riiight. I guess Houseago hasn’t had this Guardian article open in his browser tab for the last two weeks then? In 2005 thieves chopped up a two-tonne sculpture by Henry Moore, managing to reduce its value from £3m to about £1,500 in scrap bronze. Yet it would seem odd to say that £2,998,500 somehow fell out of the metal and vaporised when the axes cut into it. A small part of its value does survive in images and memories of the lost work. Conversely, the attack damaged something not precisely located in the work itself: our confidence in the safety of large public sculptures. Odd indeed. And it made me wonder what had, in fact, been lost, when this sculpture we expected to exist for thousands of years, was carted off in the night on a stolen flatbed truck. And whose fate was unknown for several years until its hacked remains were tracked to a scrap exporter in Rotterdam. 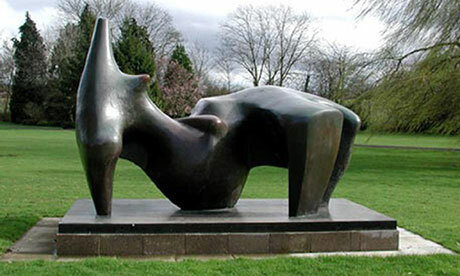 And yet whose date and title–Reclining Figure, 1969-70, LH608–the Guardian never saw fit to mention.Though accounts do report that the Henry Moore Foundation, from which it was stolen, acquired it in 1987, which, let’s come back to that. 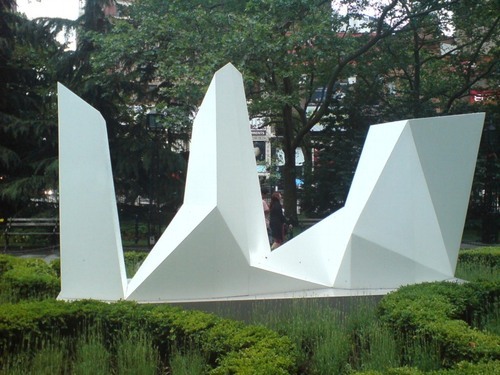 The 3.5m-long piece had only been installed the year before (in 2004) at the Foundation’s Perry Green sculpture garden. 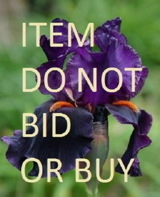 It had been brought ‘home’ from an extended loan to the Snape Maltings concert hall in Suffolk. In 1977, when he was nearing 80, Moore created a foundation to manage his body of work and legacy and to preserve his property in Hertfordshire. He passed away in 1986 at the age of 88, but he had taken ill and by the mid-80s, he had all but stopped working. The amount of casting during Moore’s final years was considerable, and not just of new work, since the Trustee [of the new Foundation] had become aware that many artist’s copies of sculpture made before 1977 remained uncast. 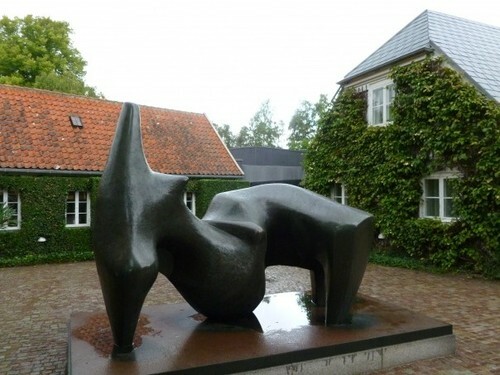 Reclining Figure LH608 was one of nine late 1986 castings of artist copies of large, pre-1977 works to move into the Foundation’s Collection. Which, I confess, though it makes it logistically easier, kind of takes the urgency out of my blindingly obvious idea: to recreate the lost Henry Moore sculpture. Which has only not been recast already because of the evolved, arbitrary constraints of the [non-Rodin] sculpture industry, which views posthumous casts differently from casts made 25 years late, while the artist was on his deathbed. Anyway, we have the technology to bring Reclining Figure LH608 back, to rebuild her. A 3-D computer model capable of driving a CNC milling machine or a 3-D printer can readily be derived from snapshots of the sculpture. All that’s missing right now is a shot of the backside, and we can help the world’s culture recover from its hypothetically tragic £2,998,500 loss. So, please, visitors to Denmark, Israel or Japan, send photos, so that Zombie Henry Moore Figure can recline once again. Last year I picked up this extraordinary photograph, and then didn’t have immediate results researching it, so I put it away until now. Then, wow. NASA launched the first Project Echo communications satelloon in 1960 to much fanfare, but the 100-foot diameter inflated Mylar sphere’s actual performance as a reflective signal relay fell short of predictions. Echo IA launched in 1960 and stayed aloft and visible from earth until 1966, but it partially deflated within a few weeks, which weakened its reflectivity. And the drag of such a large object decayed its orbital speed in ways that made it an unreliable relay. 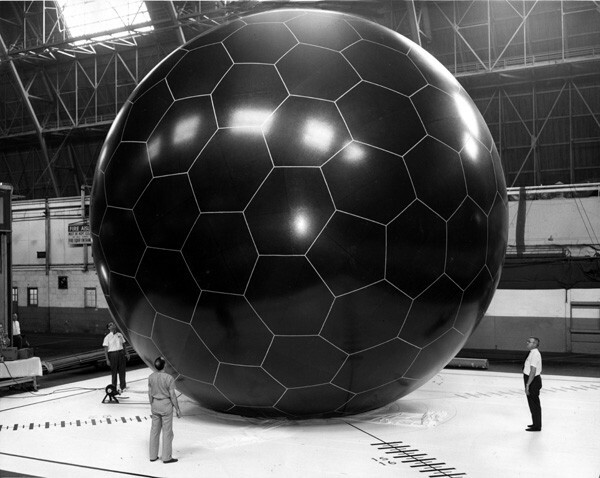 Soon after Echo II’s launch in 1964 by NASA and Bell Labs, the US Air Force began pursuing a next-generation technology with one of its leading military contractors, Goodyear Aerospace: the grid sphere. The grid sphere satellite was designed, near as I can tell, by Goodyear Aerospace engineer Howard Barrett. 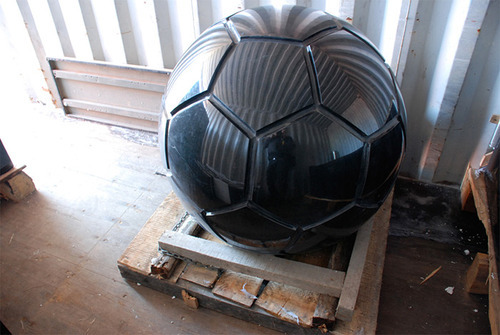 The 30-food diameter sphere of rigidized, laminated aluminum wire was embedded in a UV-sensitive plastic, which would photolyze, or disintegrate, after inflating in space, leaving the open grid sphere intact. The sphere was calculated to produce a backscatter reflection signal more than 5x as powerful as the Mylar solid sphere three times its diameter, and would be immune to its puncture, deflation, and solar radiation drag effects. 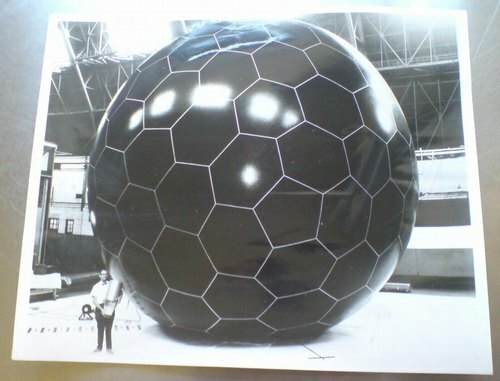 I’ve found mention of both 2-foot and 14-foot diameter grid sphere models, and another image of this 30-foot test inflation. Good gravy, did they really just inflate it using that tiny, leaf blower thing? I think it goes without saying, but I’ll say it anyway, that when it launched in 1966 from Vandenburg AFB on an Atlas rocket, the grid sphere satellite became the second-most beautiful object ever put into space. 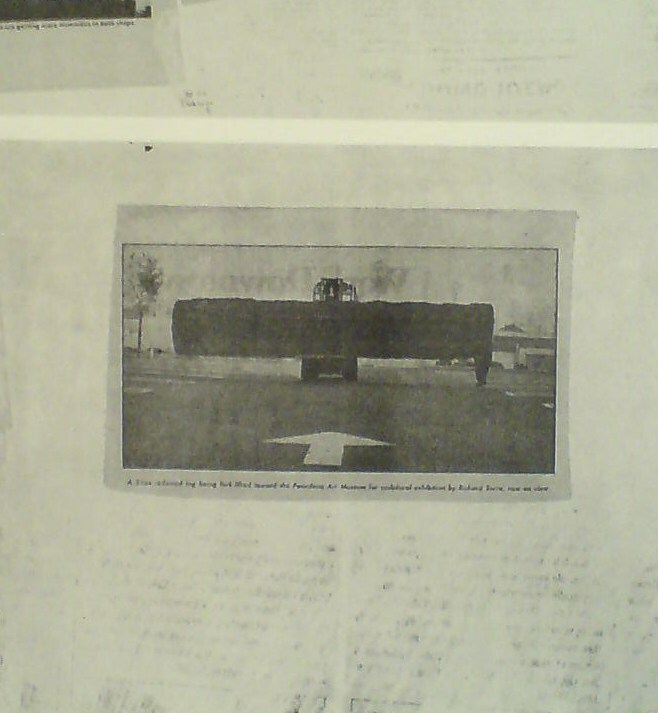 Between July 13, 1966 and May 24, 1968, when Echo IA burned up in the atmosphere, there were two satelloons and this open grid sphere, all orbiting the earth together, in Minimalism’s awesomest group show. Which would be cool enough on its own. And then Andy Beach sends me this. It’s Nicholas Mangan’s 2008 photo of Ed Grothus’s Doomsday Stone. Grothus was the atomic technician-turned-anti-nuclear peace activist-and-retail-icon who ran The Black Hole, the legendary military/scientific surplus store in Los Alamos, New Mexico. Grothus died in 2009 without being able to realize his decades-in-the-making Doomsday Stones memorial, a set of massive black granite obelisks carved with warnings in 15 languages about the destructive power of nuclear weapons. In late 2007 Ed went to the Art in Public Places board in Los Alamos to offer them his monuments for public display. They rejected them stating that ‘they couldn’t think of anywhere in Los Alamos where they would fit in’. They backed up their rejection by claiming that Ed was not an ‘Artist’ according to their set of definitions and requirements. There is something about a prophet in his own country here. Grothus’s Doomsday Stones are art in every sense of the word, and his work is an artistic practice of the highest kind, and should be recognized as such. 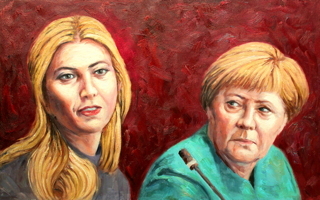 The self-proclaimed art world ignores Grothus at the peril of its own credibility and relevance. If it’s just a matter of the research not being done, let’s get on it. If we need to inflate the critical balloon to give Grothus’s reputation the structure it is obviously meant to have, let’s start blowing. From his quixotic minimalist megalomania in the desert [Heizer, Turrell, De Maria] to his performative taunts in high Catholic regalia [Klein], to his fantastical historical dumpsterdiving [Dion], Grothus is Los Alamos’ own Simon Rodia. It’s just a question of how long it’ll take everyone to realize it. I’m a bit embarrassed to admit I didn’t read it earlier, and I have to read it now, obviously, now that it’s finally been published in the US. But I wonder if my first short film may be an inadvertent adaptation of Geoff Dyer’s 1994 essay on World War I and the Memorial to the Missing of the Somme at Thiepval, France. TM: You write in the book, “The issue, in short, is not simply the way the war generates memory, but the way memory has determined – and continues to determine – the meaning of the war.” Can you describe the meaning of the war? GD: Always in the book I’m just trying to articulate impressions of it. It’s certainly not a history book. I always have faith in this idea that if I remain honest and open about my own confusion, the blurriness of my impressions – it’s not because I’m short-witted or stupid – the chances are those feelings will be shared by other people. And I just had this very distinct sense of the First World War as being something rather buried in its own memory. There’s so much discussion, as the war is going on, about how it will be remembered, or if it will be forgotten. So right from the start it just seems preoccupied with how it will be remembered. The other crucial thing is that distinction I make with the Robert Capa pictures of D-Day, where it all seems to hang in the balance and there’s a great sense of immediacy. With the First World War there’s no immediacy to it. It comes buried in so many layers of myth and memory. Hmm, actually, maybe not. Or maybe the opposite. In 2001-2, I was looking at what a place of horrible destruction was like when there was no one left who did remember it. The difference between remembering and knowing, perhaps. Or the past and the experience of the present. Also, Spiral Jetty first re-emerged in 1994, not 1999. I’d have thought the New Yorker would’ve caught that. Robert Rauschenberg’s massive 1970 silk screen edition, Currents sure is hard to miss. And not just because it’s 18 meters long. MoMA’s copy from the edition [of just six] has been wrapped around the corner of the second floor galleries for a while now. 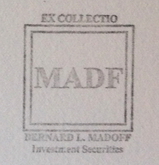 Which may have helped coax Peter Freeman into bringing out another of the screenprints last week for Art Basel. But it’s also at the end of the Rauschenberg’s segment in Emile de Antonio’s documentary, Painters Painting [above], which I rewatched recently. Bob unfurls it with a slightly soused, earnestly glib voiceover about how, even though there’s so much information packed into a daily newspaper, most people don’t read it. But if someone spends $15,000 on the info, the artist can get him to pay attention. Or at least not wrap the fish in it and throw it out. Which is ironic, I guess, because I’ve found that the size and visual uniformity has caused me to stroll by Currents without ever even slowing down. I register it as reworked newspaper content, on a giant roll, just like the real newspaper itself–but I don’t slow down to look closely. I mean, really, at that scale, how much of my time does Rauschenberg really think he’s gonna get? Above it and to the right, I’d swear that row of tract houses is a Dan Graham photo. 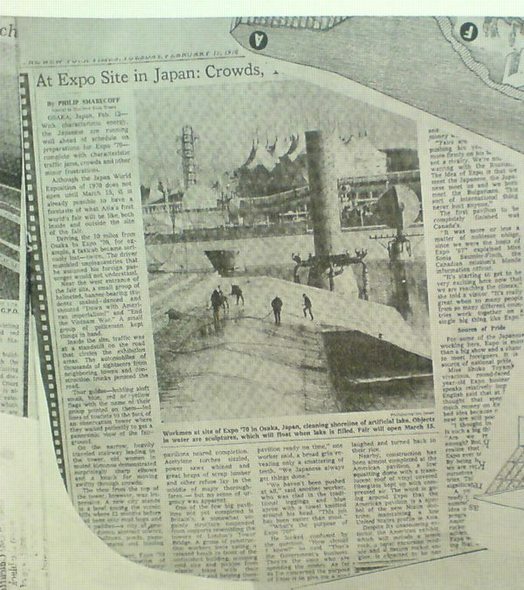 And hey, there’s a story about construction progress on Expo 70 in Osaka, where E.A.T., the collaborative Rauschenberg founded with Billy Kluver, was creating the Pepsi Pavilion, and where Rauschenberg was still thinking he’d show his own work, a plexiglass cubeful of bubbling drillers’ mud called Mud-Muse, which he’d developed with Teledyne for LACMA’s Art & Technology show and the US Pavilion. If I can spot these now-obvious contemporary art references in Currents, what else must be lurking in there? 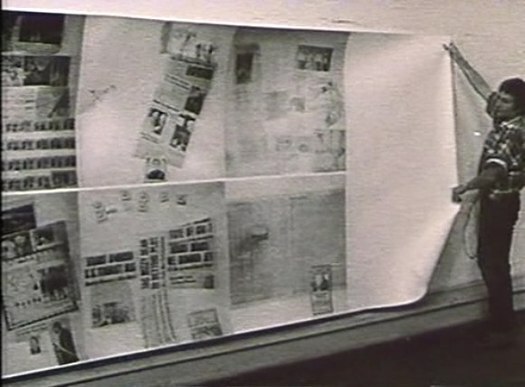 Was incorporating other artists’ images Rauschenberg’s way of tipping his hat to artists and work he liked, or was he assimilating and subsuming it in his own, sprawling scroll? 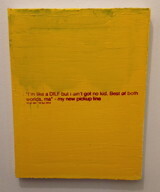 Was he engaging in a dialogue with the Conceptual and post-minimalist kids coming up or putting them in their place? Or trying to put himself in theirs? The most intriguing references now, though, turn out to be a little trickier. 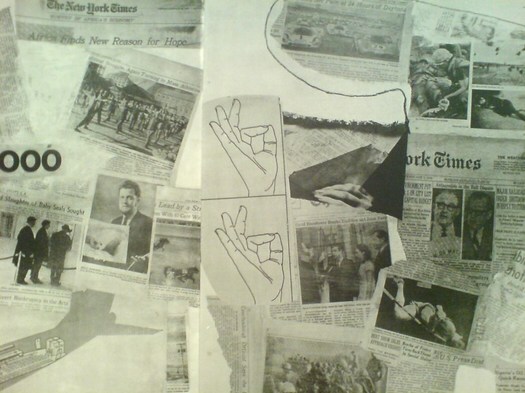 There are multiple instances of diagrams showing hands throwing the OK sign which remind me of nothing so much as the sign language woodblocks used in the prints at Jasper Johns’ latest show at Marks. 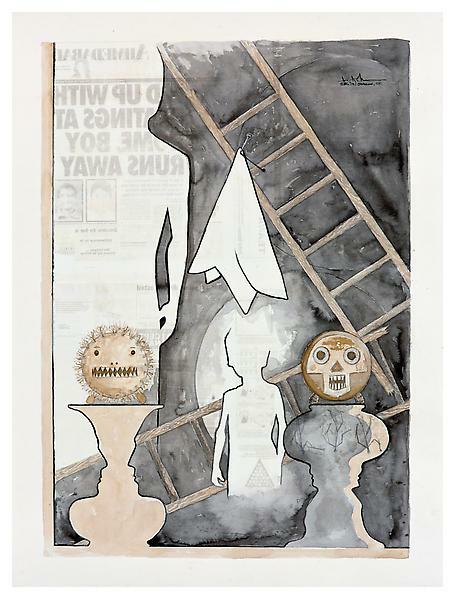 I remember thinking immediately of Rauschenberg when I saw the mirrored newspaper transfer appearing in the upper left of this Johns drawing, Untitled, 2010. 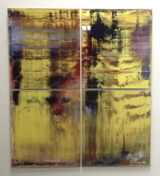 Rauschenberg began using the technique in the mid-60s, and it’s all over Currents. Remind me again how long MoMA’s had their print on view? 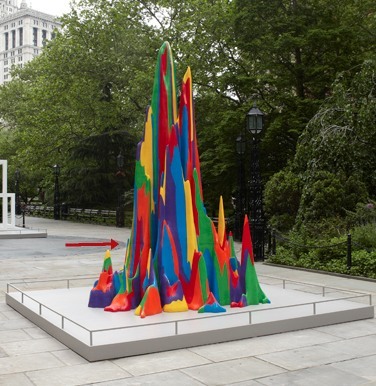 I finally made it down to City Hall Park to see the Public Art Fund’s installation of Sol Lewitt structures. Which, first or now, you must watch the discussion of working with Lewitt at the New School. Go ahead, I’ll wait. 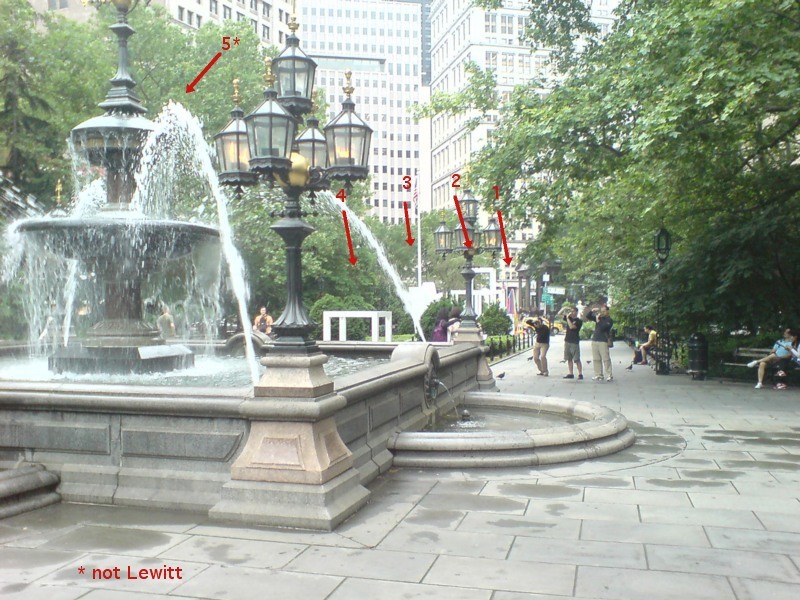 So along with the general admiration and pleasure of seeing so many Lewitts, the first thing I think is: picturesque. 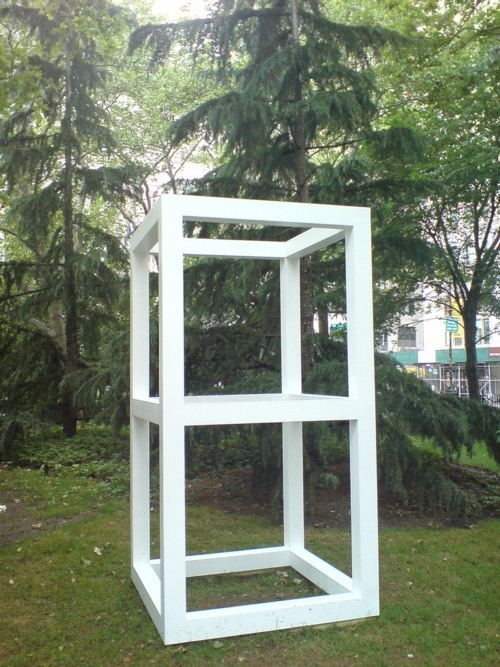 Lewitt introduced human proportions into these modules, which may somehow account for why it feels like an idyllically sited pavilion or garden folly. But it’s definitely activating something in the landscape, too. For the Complex Forms, the artist drafted a two-dimensional polygon and placed dots at various locations within it. As the form is projected into three dimensions, those interior points are elevated into space at different heights. The elevated points dictate the seams of the object’s multi-faceted surface. So these things turn out to be topographies “projected” from two dimensions into three. Maps. So it is not a stretch. 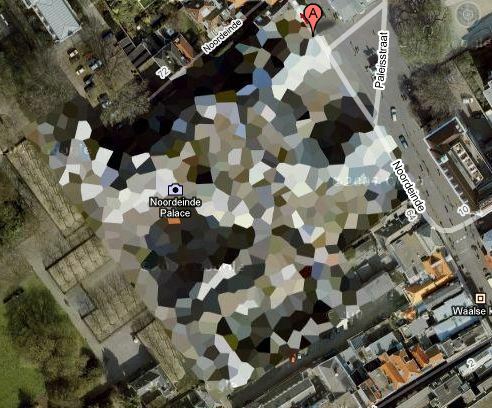 The way I found the Dutch Camo Landscapes in the first place was through architecture. They were 2D patterns generated from photos of 3D structures, which read as 3D structures themselves. As camo deployed against aerial surveillance, I’ve also imagined them as crystalline structures or surfaces, topographies, installed above whatever site is being obscured. 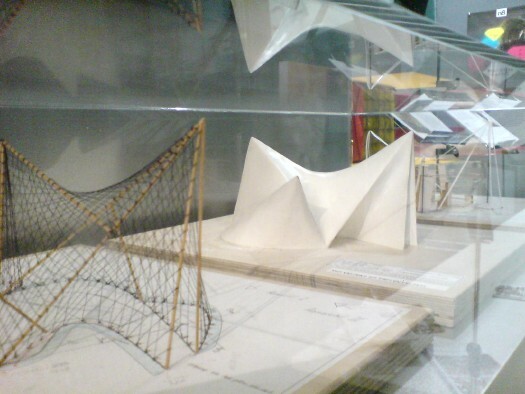 It also reminds me, even more explicitly, of Le Corbusier and Iannis Xenakis’ 1958 Philips Pavilion in Brussels, which, as these two models I found displayed shoved into a corner at ARCAM in Amsterdam one night show, was similarly constructed from 2-dimensional curves and points projected into space. “The Complex Forms introduce irregularity into Lewitt’s work,” we are told, “which is further explored, for example,” in the Splotches. Which, again, two-dimensional drawing projected into structure via formulas for generating color and height. I can really dig these things, except–I didn’t photograph it, didn’t want to be a crank, but holy crap, I can’t stop staring at that seam. 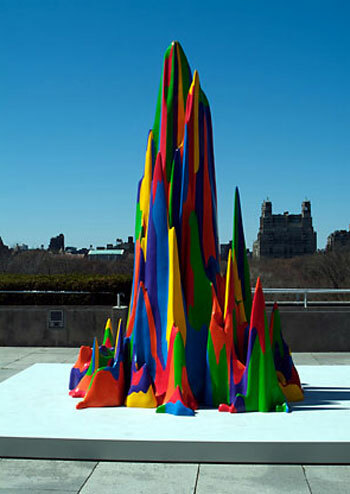 It was not like this when it was exhibited on the Met’s roof garden in 2005, was it? No, I do not think it was. What gives? The next thing is how lush and classical City Hall Park is. Since this incarnation dates from 1999, I guess historicist is the right word. I don’t remember noticing this as acutely as I do now. 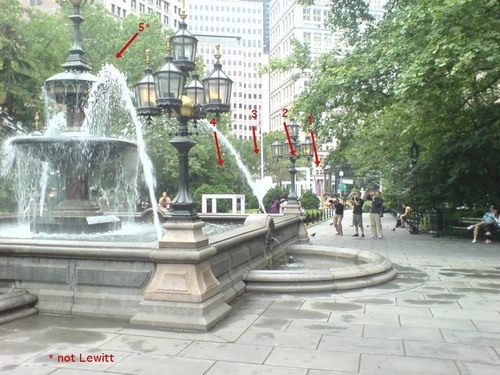 Maybe because so many Lewitts are installed along the park’s radial axis, lined up with that replica fountain just so. 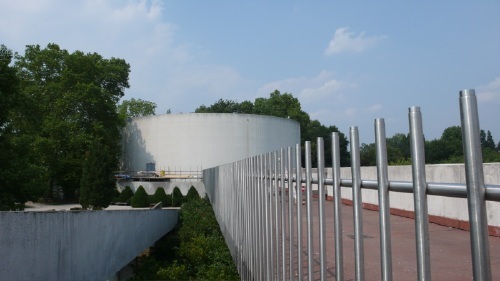 In his opening remarks at the New School, Nicholas Baume described the Public Art Fund’s program as “looking back at radical practices dating from the 1960s and registering their contemporary resonance.” He goes on to cite the appeal of seeing “the interesting juxtaposition of natural landscape [sic], New York City skyscrapers, and the architectural and decorative elements of the park,” which “provide a fascinating and rich context.” But now this installation, I get less sense of juxtaposition, and more assimilation. Radial historicism: 1. Radical practice: 0. As I’m walking around, trying to figure out how to process this situation, I suddenly looked at the Complex Structures head-on, i.e., the “wrong” way. And it turns out to be radially symmetrical itself. 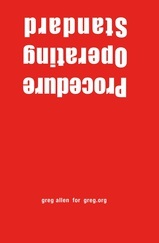 A mirror image. 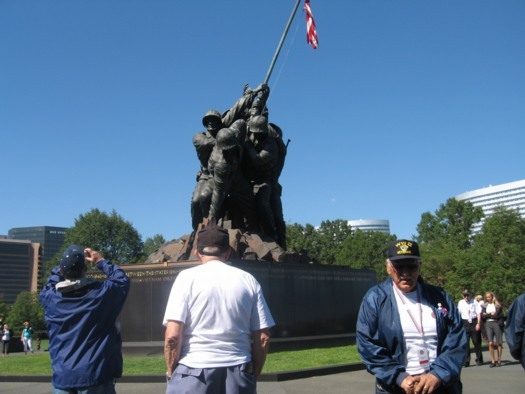 And I remember writing about laughing at first at Chinese tourists who didn’t “get” the Iwo Jima Memorial, and who posed for photos at the head of the statue, only to realize they didn’t have the same LIFE Magazine photo-mediated historical context as Americans. Which, suddenly, Lewitt’s practice of projecting a 2D image into a 3D structure has an entirely new, complicated legacy which I’ve never seen addressed before, but maybe this City Hall Park is a good place to start. The Free Speech Movement Monument Was Censored. Remarkably, the Berkeley University administration only accepted the monument on the condition that any reference at all to the Free Speech Movement be stricken from the work and any surrounding publicity. A podcast I’d never heard of but really like now, 99% Invisible, has the story of the Free Speech Monument, and an interview with the artist. Thomas Lawson’s 2010 interview with Andrea Bowers is like five kinds of great. 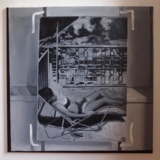 It concerns the works in her show at Susan Vielmetter in Los Angeles, “The Political Landscape.” Bowers’ story of making a video piece about activist and Bush-era public land auction-saboteur Tim deChristoph has some nice critiques of the Earth Art Boys. And it’s surprising how surprising so many of the reactions were to her immigration- and border-related drawings. AB: Yes, it’s a hundred-foot drawing. TL: And it is set up as a memorial, it’s a very grand piece. Let’s talk about it. Since it is monumental, it presumably required a different way of working? AB: Right. I worked with a graphic designer and several assistants. It resulted from a conversation with an activist, Enrique Morones. He founded an organization called Border Angels. They started off in I think ’86, providing water and blankets to people crossing the border. TL: And many die in the attempt–are they killed out there in the desert, or do they die from exposure and thirst? AB: It’s both, but in many cases nobody knows. A lot of people die from dehydration or temperature, but there are also people who are killed. So Enrique collects names of anyone who dies migrating from Mexico to America. He actually has about ten thousand names. He finally admitted that the group of names he provided to me, a list of four or five thousand, is only up to the year 2000. I’ve always been making memorials in one way or another, but memorials that I thought would never be made, or memorials that were kind of impossible to make. I’m fascinated by the Vietnam Memorial in DC, and how listing names functions in general. 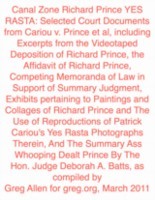 An important part of what I do concerns this documentary-type collection of information. So Dan Hill’s posted another of his typically incisive analysis of an urban situation. 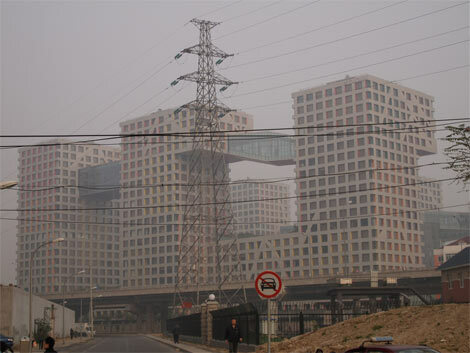 This time it’s his extended and engrossing account of visiting Linked Hybrid, the massive urban development in Beijing, designed by Steven Holl Architects, which was just opening at the time [late 2009]. What can this possibly mean in this context? The absorption of the brand of ‘starchitecture’ is easy to see in a culture shifting through the gears of consumer culture, but of the brand of the United States? That’s no moon. It’s the proposal for Memorial Square, the World Trade Center site put forward in 2002 by Holl, Charles Gwathmey, Richard Meier, and Peter Eisenman, or as they called themselves at the time, the Dream Team. At the time–the day after the unveiling, actually, at a screening of my short film, Souvenir (November 2001), which was followed by Etienne Sauret’s incredible documentary short, The First 24 Hours–I recognized the form the Dream Team was proposing as a gargantuan evocation of the fragments of the World Trade Center’s facade. They denied the reference, even as they awkwardly argued and edited around it on the Charlie Rose Show. But I think it’s self-evident. Anyone wanting to argue otherwise to me should read those two posts and the links within first. 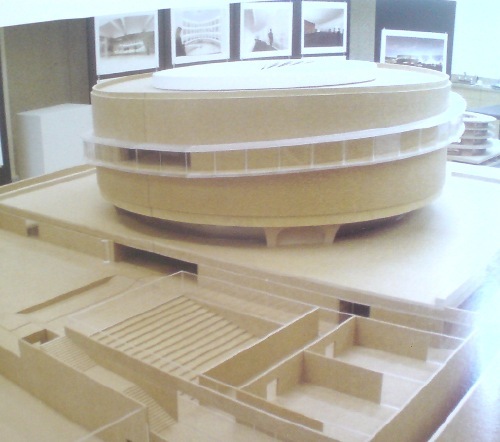 Then I’ll tell you my story about asking Eisenman about it face-to-face. 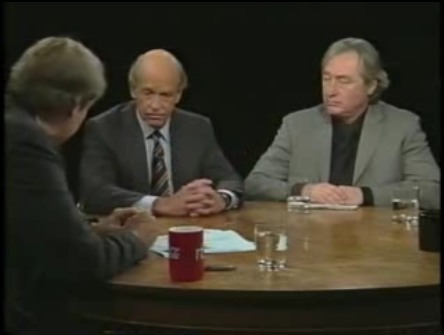 What’s fascinating now, though, in rewatching that Charlie Rose episode, is not the Dream Team proposal’s basis in the wreckage of the World Trade Center, but its multiple similarities to Holl’s Linked Hybrid. While the Team took great pains to deny the proposal had any “signature” style, I would speculate otherwise. 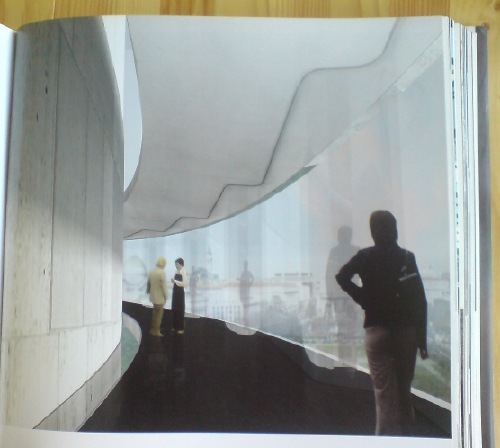 The overall concept of structure capturing “a moment” in history and memory comes from Eisenman’s proposal [above] for Herbert Muschamp’s WTC charette. Meanwhile, the form is Holl’s, as is the idea that its entire surface would glow at night on one face. The rendering resembles nothing so much as the skyscraper cousin to Holl’s residence for the Swiss ambassador to Washington. 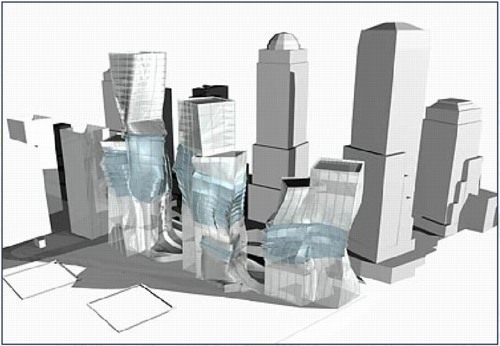 are the urban and sociological failures of Linked Hybrid really any better or worse than the manipulated politicized mess that Daniel Libeskind’s World Trade Center plan has wrought? 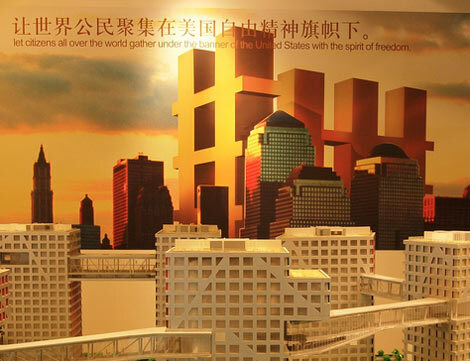 I think the more sobering path is to recognize the remarkable extent to which Holl succeeded in realizing his Dream Team’s proposal for downtown Manhattan in Beijing–and to acknowledge that, there but for the grace of George Pataki go we. Linked Hybrid’s marketers invite “citizens all over the world [to] gather under the banner of the United States with the spirit of freedom.” But on this day, when citizens all over the world gather to protest the continued imprisonment of Ai Weiwei, the co-creator [with Swiss architects Herzog & deMeuron] of the China’s most famous public building, the Bird’s Nest Olympic stadium, can we really say “our” public sphere is superior, or even free? Architecturally speaking, at least, we are all New Yorkers now, and Beijingers, too. Last May, while solving the problem of Gettysburg and reuniting the opposing forces of History–Civil War battlefield aficionados seeking to “restore” the “hallowed ground” of Cemetery Ridge and the modernists and historical preservationists who wish to stop them from demolishing Richard Neutra’s Cyclorama building–I myself was smitten by the archival/architectural awesomeness of the steel observation tower [below], which was built by the War Department in 1895 on the [equally hallowed, I’m sure] Confederate line. While I have not been able to find much in the way of history or documentation for the 1895 towers [there used to be five; now there are 2.5], I have discovered two accounts of a re-enactment of Pickett’s Charge in July 1922, on the occasion of the 59th anniversary of the battle. 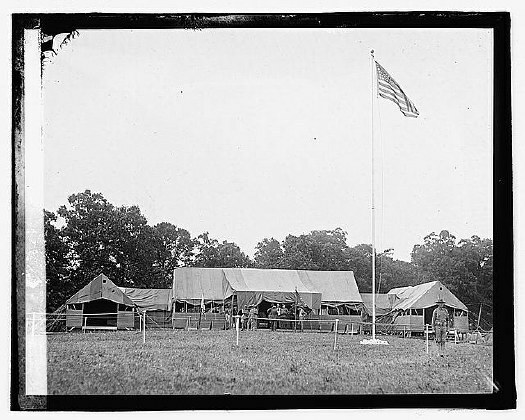 On July 2 President Warren G. Harding and his wife observed a rehearsal re-enactment by 5,000 marines and veterans from an observation tower [since removed] on Cemetery Ridge itself. And so the tread of marching armies and the roar of cannon over the Summer lands of Pennsylvania call the American people to express the value of the titanic struggles of the ’60s in deeper love and pride of country. 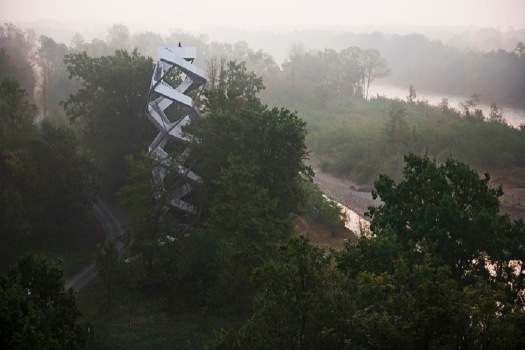 And the other thing, holy moley, have you seen the observation tower built by the Graz/Munich-based landscape design firm Terrain in a nature preserve along the Mur River in Styria, Austria?? 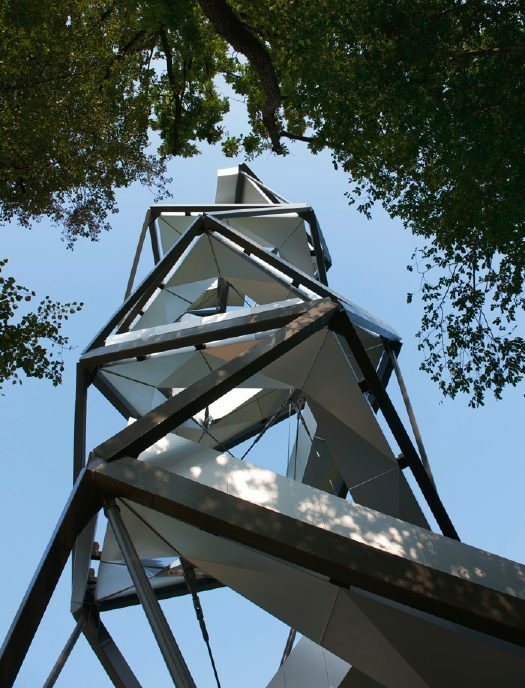 27.5 meters high, double rectangular spiral of black steel and tension rods, plus aluminum staircases. Not that I thought anyone might be wavering on the architectural merits of observation towers or anything, just, wow. 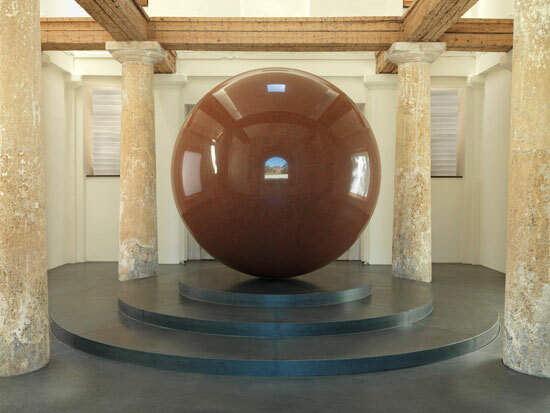 Christopher Knight took the occasion of an Alberto Burri retrospective in Santa Monica to tweet about Cretto, the artist’s absolutely incredible 20-acre memorial/earthwork, in which the earthquake ruins of the Sicilian town of Gibellina were encased in a grid of concrete. I’d mentioned Cretto in 2006, including a basic Google Map image. 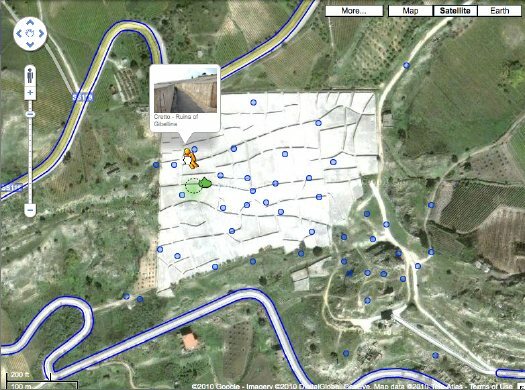 Well, Street View has come to Gibellina. At some point, I suspect no one will marvel at the idea of using your laptop to drive around the backroads of Sicily, or to dive into geotagged photos of remote land artworks. But that point is not yet. The Street View images in particular have a great, desaturated feel that makes me imagine I’m right there for the ribboncutting. The future and the past is now. Some Pointers, Or What To Do With Neutra’s Gettysburg Cyclorama Center? 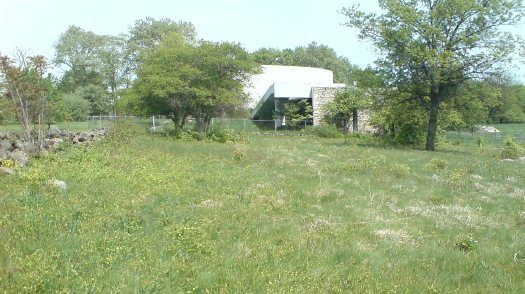 The Park Service’s stated goal for Gettysburg is the “rehabilitation” of the battlefield to its 1863 condition by removing modern structures like Richard Neutra’s Cyclorama Center [designed, it should have been noted a long time ago, with Robert Alexander] and the visitors center next to it [already gone] which are built on “hallowed ground.” Which is not quite so simple. The rehabilitation/re-sanctification plan to remove post-1863 structures does have some loopholes: anything in the middle of the battlefield but on private land across the street, as long as it serves popcorn chicken and/or deliciously dark chocolate pies for a limited time only; the 1392 or 1600 markers and monuments placed by “the veterans themselves,” or whomever; and the three remaining observation towers the War Department built. What do you get for your steep, 6-7 story climb up the steel cage? A great view, of course. But also understanding. Context. Orientation. It’s the place where people tell stories of troop movements and battle strategies. There is much pointing. All across a vast landscape like this, we saw people orienting themselves, spotting landmarks, and telling stories. They were mapping the action and the meaning, translating history onto the site in front of them. 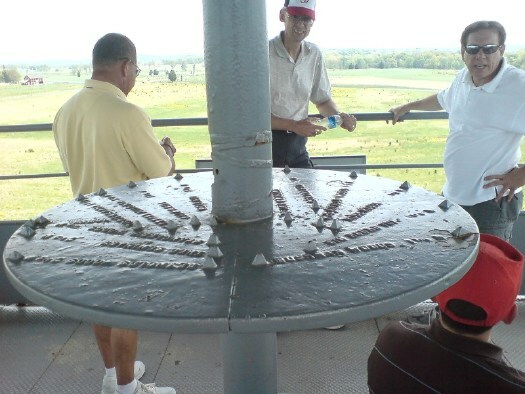 Weeks’ book notes that observation points have been a popular and vital feature of visitors’ experience at Gettysburg from very early on. Some are natural spots, like the promontories of Little Round Top and the Copse of Trees at Cemetery Ridge. Some were built, like Round Top Park, the War Dept. towers [there used to be five], the Pennsylvania State Monument–and the Cyclorama Center. 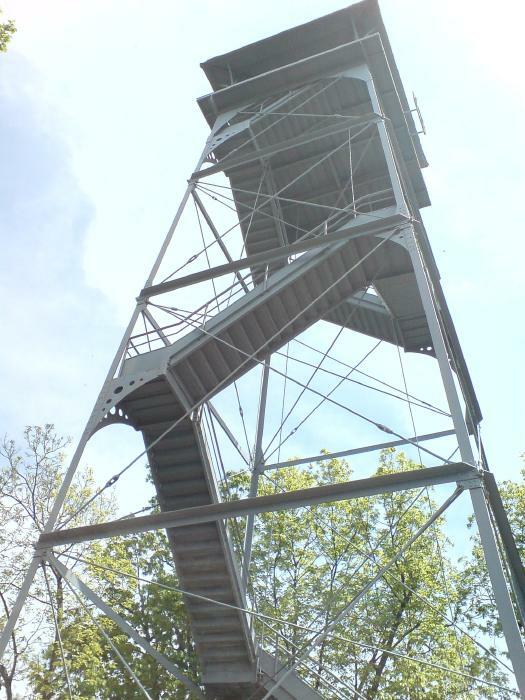 The biggest observation tower, built on private land, was seized and destroyed in 2000 after an intermittent, 26-year legal battle. 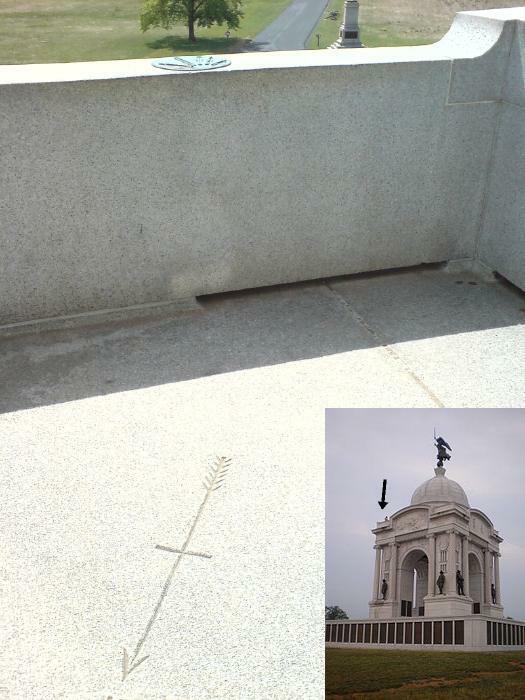 Weeks draws the connection between the dioramas and orientation maps, the cycloramas–almost all of which had their origins in commercial/entertainment enterprises–and the site itself; arguably, facilitating this mental transition from representation to site was the major justification for placing the Cyclorama so close to its focal point, the top of Cemetery Ridge, in the first place. These arrows, on these structures, point, I believe, to a possible future for Neutra’s Cyclorama: restore and reconfigure it as an observation and orientation platform for Cemetery Ridge. Neutra already included an observation platform and ramp [see house industries’ photo below]; adapting the empty rotunda for observation would hew close to the building’s original function on its original site, while minimizing the loss of Neutra’s and Alexander’s key design elements. 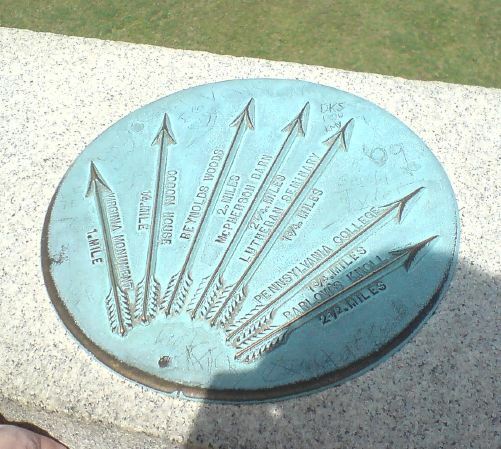 Then there’s precedent: the Park Service’s stated strategy of 1863 rehabilitation nevertheless preserves several post-1863 observation structures, including the unassailable Pennsylvania Monument and three of the five towers apparently installed by the War Department at the founding of the Memorial Park. One is apparently historical and/or functional enough to preserve even after being truncated to just one story up–roughly the same height as the Cyclorama’s existing deck. 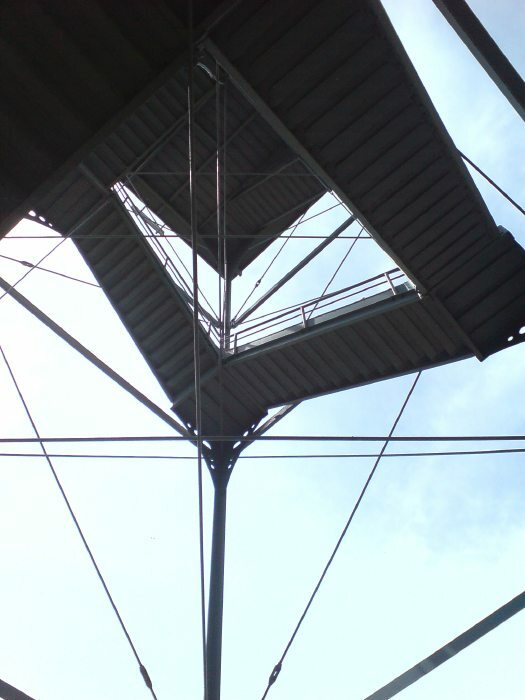 A Cyclorama Observation Platform would also offer something completely unique: accessibility. All other observation spots we saw involved stairs, curbs, or uneven wooded trails. [The Pennsylvania Monument’s vantage point is reached by a single, awesomely treacherous spiral staircase lined with stamped bronze paneling that’d do a SoHo loft ceiling proud.] Much of the battlefield itself–and thus the monuments scattered across it–quickly becomes inaccessible to disabled or wheelchair-using visitors. In fact, a speculative observation platform proposal has already been floated. The Boston-based architecture firm CUBE design + research used Neutra’s Cyclorama Center to illustrate a range of alternatives to strict historical preservation. One idea [above]: turning the Cyclorama as “informant” and “information hub,” by making strategic, view-framing cuts in the rotunda. It’s a pretty radical alteration, the kind of thing that keeps traditional preservationists up at night. And as proposed/rendered, I think many of Cube’s solutions go way too far. But they’re spurring discussion, not answering an RFP, and in that, they succeed. 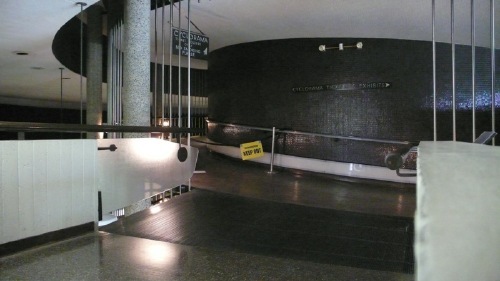 Maybe an information-filled ramp could spiral up the inside of Neutra’s rotunda–a history of the wounded, perhaps, and their heroism and their tales of endurance and remembrance–and then let visitors out to wind their way down the outside, where they could then descend along the original ramp onto the battlefield itself. At least as far as their wheelchairs can take them. The Park Service and Gettysburg Foundation claim the current battlefield rehabilitation plan provides great “environmental benefits,” even as the courts find they have failed to undertake the basic impact studies required by law. Worse than this, though, is the active, and ongoing denial of the equality of us all–by denying equal access to key parts of the battlefield experience, such as observation platforms–on the very battleground of freedom made sacred by the sacrifices of life. And limb.